Special Education Teacher Aides are accountable for supporting students with special needs. Working alongside Special Education Teachers, these Aides handle and support students with their eating habits, and various other daily activities. 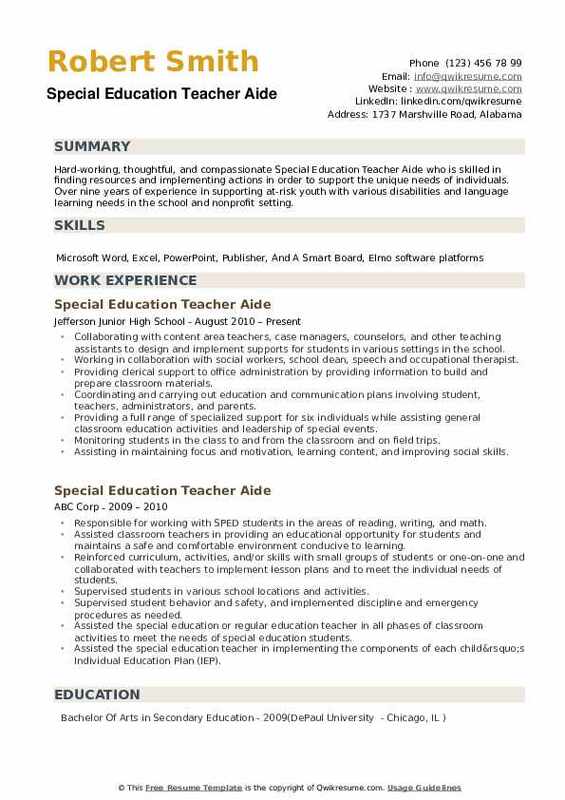 The typical duties that can be seen on the Special Education Teacher Aide Resume include – developing classroom curriculum, imparting specialized education, assisting students with their personal care, supporting with student’s mobility needs, monitoring students, applying and removing equipment such as leg braces or body braces from students, and assisting lead teachers. 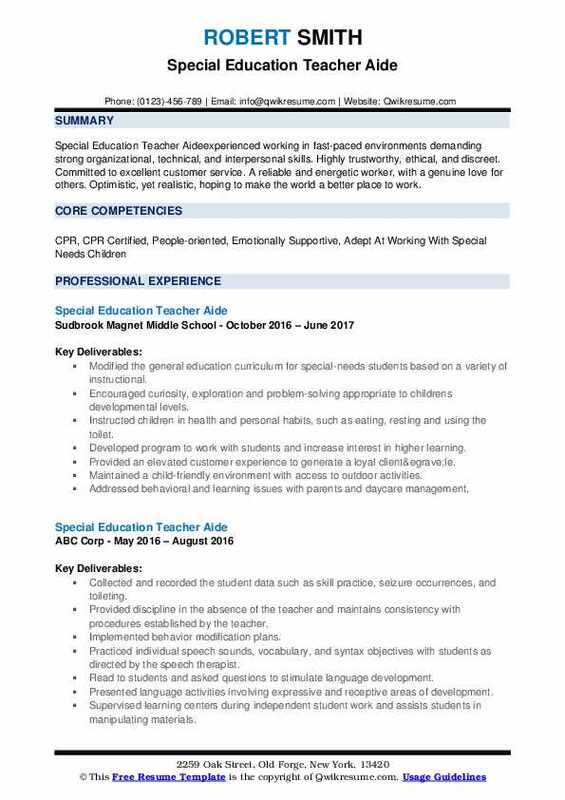 Those seeking to work as a Special Education Teacher Aide should demonstrate on the resume skills and abilities such as – special education expertise, physical fitness, empathy, and record maintaining skills, computer literacy, and CPR certification; a good understanding of working with people having emotional, mental or physical disabilities is also required. As this role is a sensitive one, it is highly essential that applicants have at least an Associate’s degree in Special Education. 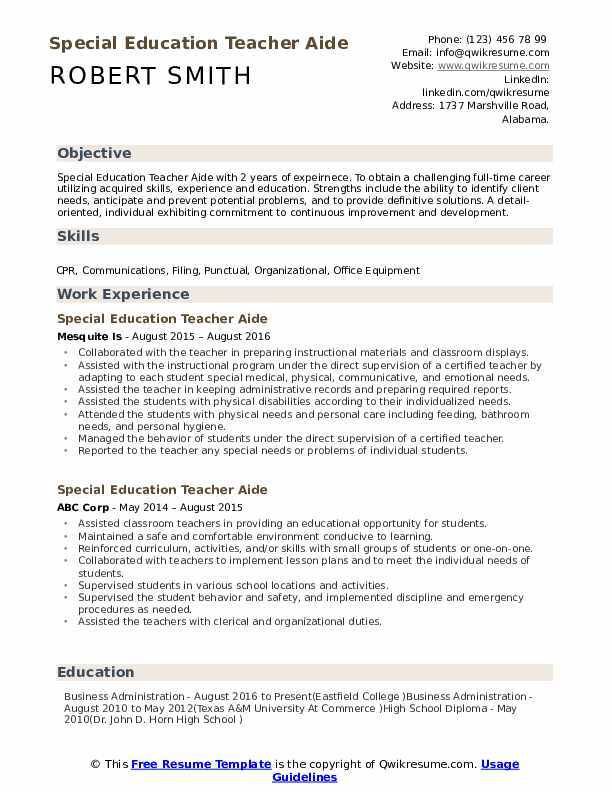 Objective : Special Education Teacher Aide with 2 years of expeirnece. To obtain a challenging full-time career utilizing acquired skills, experience and education. Strengths include the ability to identify client needs, anticipate and prevent potential problems, and to provide definitive solutions. A detail-oriented, individual exhibiting commitment to continuous improvement and development. Collaborated with the teacher in preparing instructional materials and classroom displays. Assisted with the instructional program under the direct supervision of a certified teacher by adapting to each student special medical, physical, communicative, and emotional needs. Assisted the teacher in keeping administrative records and preparing required reports. Assisted the students with physical disabilities according to their individualized needs. Attended the students with physical needs and personal care including feeding, bathroom needs, and personal hygiene. Managed the behavior of students under the direct supervision of a certified teacher. Reported to the teacher any special needs or problems of individual students. Assisted the assessment team by administering achievements and/or development tests. Participated in staff development training programs, faculty meetings, and special events as needed. 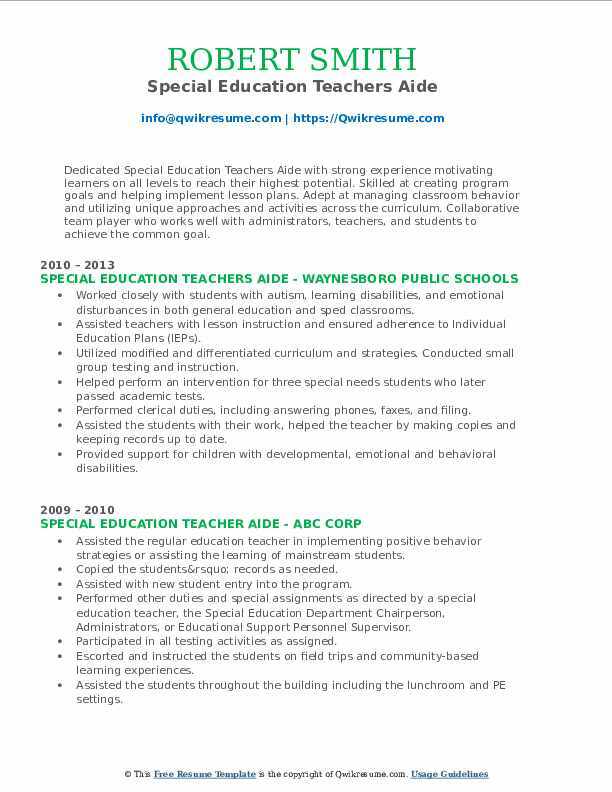 Objective : Special Education Teacher Aideexperienced working in fast-paced environments demanding strong organizational, technical, and interpersonal skills. Highly trustworthy, ethical, and discreet. Committed to excellent customer service. A reliable and energetic worker, with a genuine love for others. Optimistic, yet realistic, hoping to make the world a better place to work. Modified the general education curriculum for special-needs students based on a variety of instructional. Encouraged curiosity, exploration and problem-solving appropriate to children's developmental levels. Assisted in the implementation of classroom programs, including self-help, behavior management, and instruction programs. Assisted the special education teacher to provide for physical and instructional needs of students with disabilities in a special education setting. 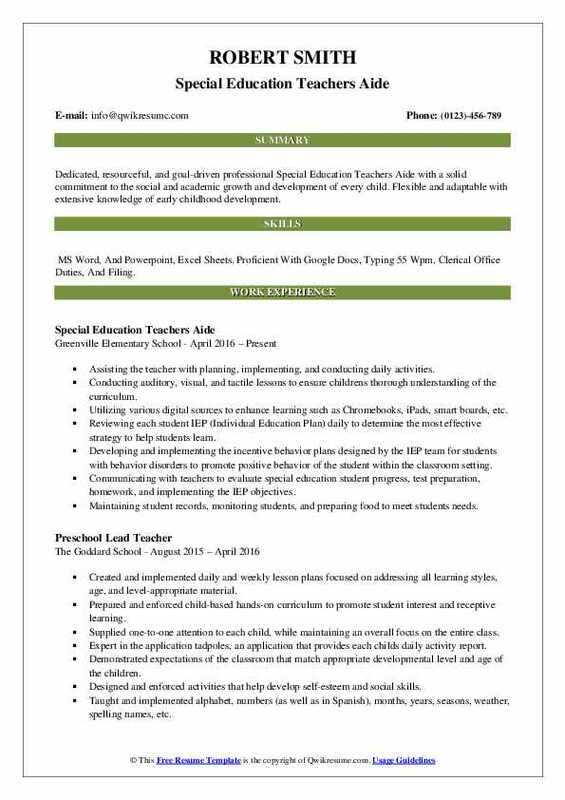 Objective : Dedicated, resourceful, and goal-driven professional Special Education Teachers Aide with a solid commitment to the social and academic growth and development of every child. Flexible and adaptable with extensive knowledge of early childhood development. Skills : MS Word, And Powerpoint, Excel Sheets. Proficient With Google Docs, Typing 55 Wpm, Clerical Office Duties, And Filing. Assisting the teacher with planning, implementing, and conducting daily activities. Conducting auditory, visual, and tactile lessons to ensure children's thorough understanding of the curriculum. Utilizing various digital sources to enhance learning such as Chromebooks, iPads, smart boards, etc. Reviewing each student IEP (Individual Education Plan) daily to determine the most effective strategy to help students learn. Developing and implementing the incentive behavior plans designed by the IEP team for students with behavior disorders to promote positive behavior of the student within the classroom setting. Communicating with teachers to evaluate special education student progress, test preparation, homework, and implementing the IEP objectives. Maintaining student records, monitoring students, and preparing food to meet students needs. Headline : Special Education Teacher Aide with 5 years of expeirnece in the Education domain. To obtain a career in a field that will magnify my skills, knowledge, and attributes to help support the goals and objective of the workplace and ultimately making a positive impact. Looking to meet new challenges and add value to an organization by utilizing excellent interpersonal and problem-solving skills. Worked one-on-one with students from kindergarten to eighth grade in a self-contained classroom. Worked with students with physical and learning disabilities as well as severe Autism, ADHD, OCD, Aspergers, Bipolar Disorder, Anxiety disorder and behavioral issues. Assisted in devising special strategies for reinforcing learning materials and skills based on the sympathetic understanding of individual students, their needs, interests and abilities. Developed an overall awareness to remain understanding and patient when it comes to working with students, always remaining calm even during turbulent times. Demonstrated an ability to look past the students diagnosed disorder or disability and more so at their positive characteristics, the skill-set they possess, and capabilities. Helped students with hygienic and personal care needs, implementing and teaching basic life skills. Organized documentation and inputted data into Microsoft office products and worked with smart board technology. 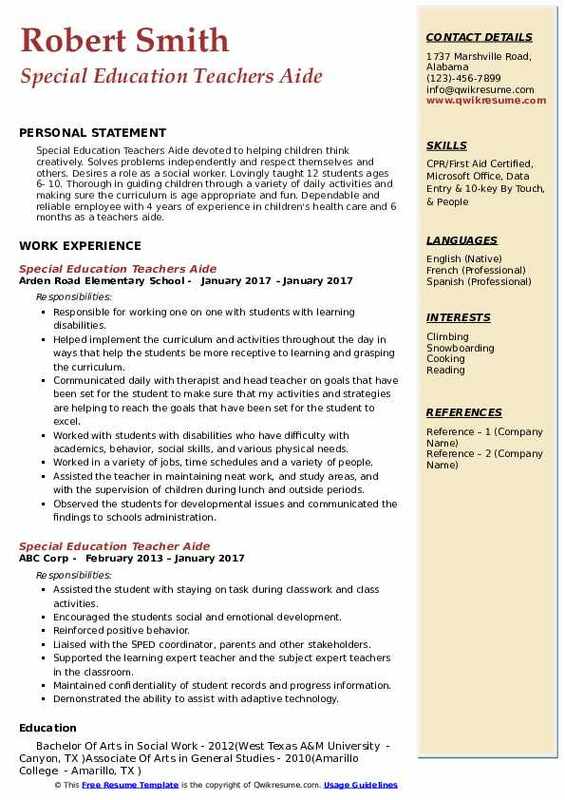 Summary : Special Education Teacher Aide seeking a career opportunity to utilize my skills and experience to a mutual benefit. Offering strong customer service, attention to detail, and bilingual (English/ Spanish). Experience in working with a culturally diverse population interpersonal communication with the ability to engage thoughtfully and effectively. Ability to work efficiently in both an independent and group setting. Helped meet physical/instructional needs of individual students with disabilities inside and outside the classroom. Assisted with physical needs and personal care including feeding, bathroom. Intervened in crisis situations and restrained disruptive students as needed. Worked with assigned students or small groups to develop motor skills and conducted assigned instructional exercises. Kept the teacher informed of special needs or problems of assigned students. Participated in professional development programs, faculty meetings, and special events as assigned. Assisted students with academic tasks, daily living routines, and social-emotional skills. Documented progress and needs for improvement in order to support mental and educational needs while maintaining open communication with teachers, parents, and administration. 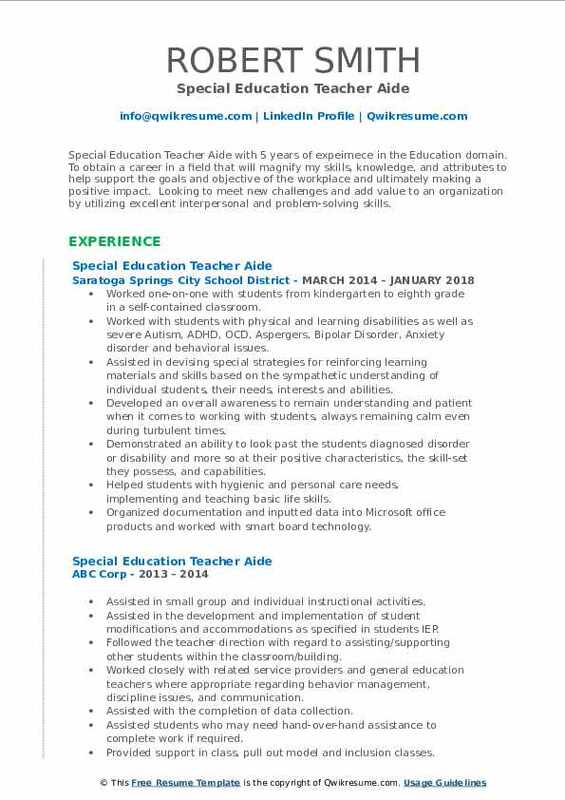 Summary : Experienced, success-oriented Special Education Teacher Aide seeking to leverage abilities to a new level of responsibility. Looking to meet new challenges and add value to an organization by utilizing excellent interpersonal and problem-solving skills. Excellent leadership and interpersonal dependability showed through consistency. Assisting in the educational and social development of students under the direction of the lead teacher. Assisted in the implementation of individual education plans for students and monitor their progress. Provided support for individual students inside and outside the classroom to enable them to fully participate in activities. Supported the students with emotional or behavioral concerns and assist them in developing appropriate social skills. 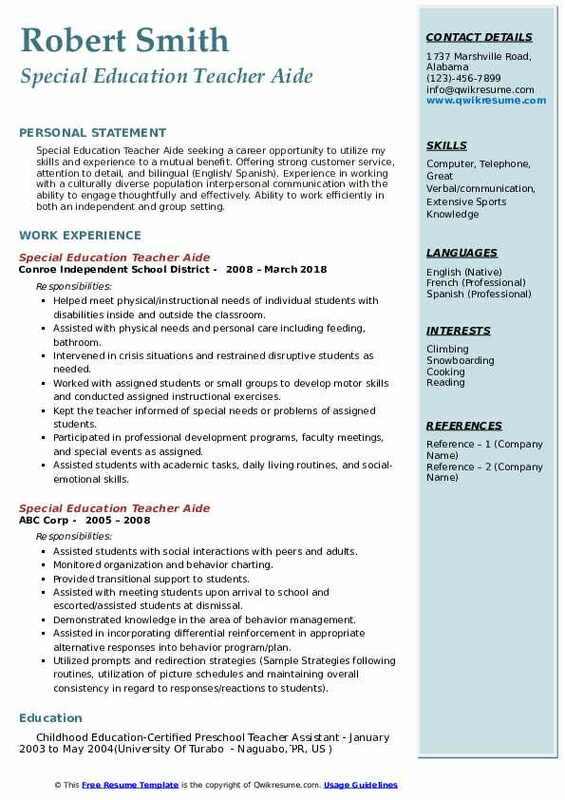 Assisted classroom teacher with lesson plans, classroom support and administrative duties as needed. Assisting teachers with the planning of activities for students throughout the school day. Supporting classroom teacher in implementing lessons, creating materials and managing activities. Implementing accommodations as documented in students Individualized Education Program (IEP). Assisting 6 inclusion students daily in their general education classes for particular subjects. Objective : Dedicated Special Education Teachers Aide with strong experience motivating learners on all levels to reach their highest potential. Skilled at creating program goals and helping implement lesson plans. Adept at managing classroom behavior and utilizing unique approaches and activities across the curriculum. Collaborative team player who works well with administrators, teachers, and students to achieve the common goal. Worked closely with students with autism, learning disabilities, and emotional disturbances in both general education and sped classrooms. Assisted teachers with lesson instruction and ensured adherence to Individual Education Plans (IEPs). Utilized modified and differentiated curriculum and strategies. Conducted small group testing and instruction. Helped perform an intervention for three special needs students who later passed academic tests. Performed clerical duties, including answering phones, faxes, and filing. Assisted the students with their work, helped the teacher by making copies and keeping records up to date. Provided support for children with developmental, emotional and behavioral disabilities. Supported the classroom teacher in conducting daily instructional activities and monthly testing in a class with 13 students. 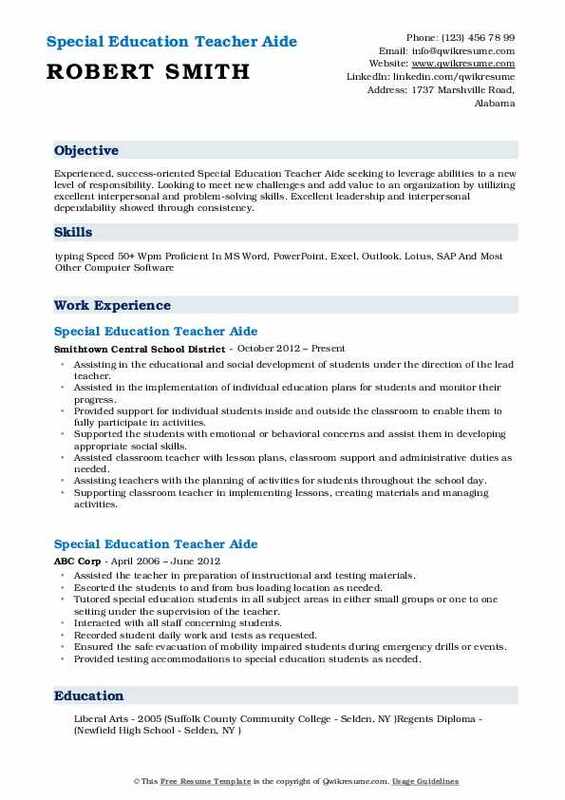 Objective : Driven Special Education Teacher Aide who is highly efficient in team building and academic/professional development. Expert in explaining complex and basic curriculum to a diverse set of people. Highly adept in database management and strategic planning. Able to skillfully function while working independently and while in coordination with others. Providing support to a group or individual of students during instructional time to ensure children are engaged in their academics and are active participants in the general education and autistic classrooms. Assisting other classroom aides and lead teachers during small group reading, writing, math centers, social studies, and science lessons. Providing support during the following activities, getting on and off the bus, lunch, engagement during specials, field trips, etc. Implementing the age-appropriate activities and monitor safety throughout the day. Supporting the students with special needs by implementing their individualized education programs and listening to their concerns and interests. Communicating with students to explain the expectations for their learning and behavior. Maintaining the organized records of students work completion, homework, and behavioral data. Objective : Special Education Teachers Aide devoted to helping children think creatively. Solves problems independently and respect themselves and others. Desires a role as a social worker. Lovingly taught 12 students ages 6- 10. Thorough in guiding children through a variety of daily activities and making sure the curriculum is age appropriate and fun. Dependable and reliable employee with 4 years of experience in children's health care and 6 months as a teachers aide. Responsible for working one on one with students with learning disabilities. Helped implement the curriculum and activities throughout the day in ways that help the students be more receptive to learning and grasping the curriculum. Communicated daily with therapist and head teacher on goals that have been set for the student to make sure that my activities and strategies are helping to reach the goals that have been set for the student to excel. Worked with students with disabilities who have difficulty with academics, behavior, social skills, and various physical needs. Worked in a variety of jobs, time schedules and a variety of people. Assisted the teacher in maintaining neat work, and study areas, and with the supervision of children during lunch and outside periods. Observed the students for developmental issues and communicated the findings to schools administration. 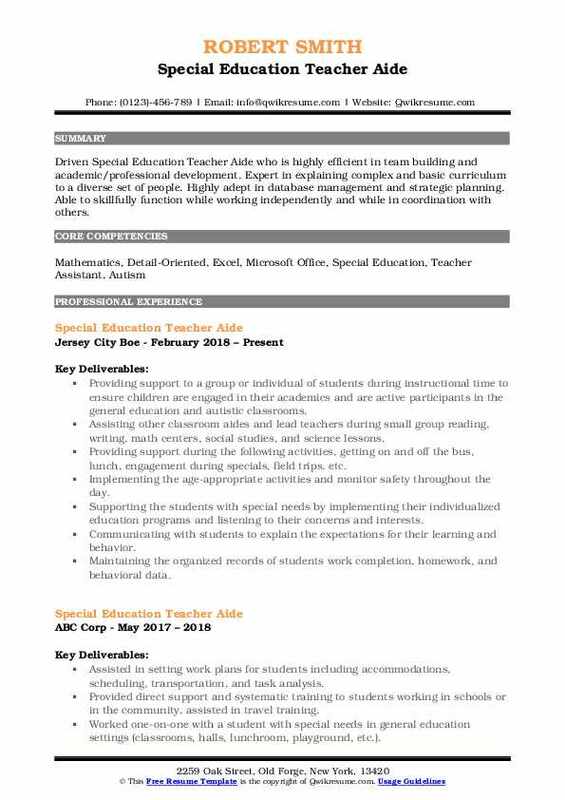 Summary : Hard-working, thoughtful, and compassionate Special Education Teacher Aide who is skilled in finding resources and implementing actions in order to support the unique needs of individuals. Over nine years of experience in supporting at-risk youth with various disabilities and language learning needs in the school and nonprofit setting. Collaborating with content area teachers, case managers, counselors, and other teaching assistants to design and implement supports for students in various settings in the school. Working in collaboration with social workers, school dean, speech and occupational therapist. Providing clerical support to office administration by providing information to build and prepare classroom materials. Coordinating and carrying out education and communication plans involving student, teachers, administrators, and parents. Providing a full range of specialized support for six individuals while assisting general classroom education activities and leadership of special events. Monitoring students in the class to and from the classroom and on field trips. Assisting in maintaining focus and motivation, learning content, and improving social skills. Observing the life skills program, which works with students with various physical and mental disabilities.